We landed in Cusco in the morning, and by the time we got to the hotel it had been 24 hours since we left home! Thankfully our hotel had a room prepared already so we could check in early. It was a relief to lie down and relax for an hour, recuperate after our long flight, and then hit Cusco’s historical centre for a spot of lunch. The town is beautiful, typical of South America with a gorgeous town square. Your eyes are immediately drawn to the extravagant Cathedral, but we decided to explore a convent just outside of the square, which was built above an Inca ruin known as Qorikancha. In Inca times this was where they stored their offerings for the gods (aka gold). Now we see mostly colonial architecture, as it was built over the Inca site, but they have excavated parts and turned the convent into a museum, displaying ruins and models to reconstruct what the Qorikancha looked like. The second day was our most packed itinerary of the trip, we had so many amazing experiences. We met our guide, Henry, in the morning, and on our journey to the first location he was able to answer our questions. I had noted that on the outskirts of the city a lot of the buildings seemed unfinished, abandoned even. I assumed it was related to running out of money, and I wasn’t far off! Apparently as land is so expensive in Cusco, landowners want to maximize their income by building more stories, but of course this is also more expensive to build. So they complete the first level and begin to rent this out, and with the money they make from this they are then able to complete the next floor, and so on. However in the historical centre the regulations are much stricter, most building are only two stories high. We arrived at a local artisans workshop, where we were greeted by Alpacas. They demonstrated how they treat and dye the alpaca wool, using all natural ingredients to do so. Cactus and different kinds of flowers are used for the main colour, and then various salts or citrus acid can be added to adapt the hue. We were then given the opportunity to look around afterwards, and here I bought my souvenirs for the trip! Our next stop was the Sacred Valley, Moray, which had Inca ruins, followed by the Salt Mines. Moray was beautiful and remains a mystery to archaeologists, who still have not discovered the purpose of the site. At first look it resembles Greek amphitheatres, but there is no evidence that supports this theory. We can make educated guesses, my feeling is it had something to do with agriculture! The Salt Mines were my personal highlight of the entire trip, as I’d never seen anything like it. There are over 3000 pools! We then went to Ollantaytambo, a quaint town with an abundance yellow painted houses. The cobbled streets were filled with so many lone dogs, we thought they were strays. In fact they have owners, they are just given the same freedom cats and roam the streets as they please. Here we visited another Inca site, and then had a cocktail in the town before getting on our train to Aguas Calientes (aka Machu Picchu town). The train followed along the river, a picturesque journey, and we watched as day turned into night. We were thrilled to discover that our hotel, Rupa Wasi, was in fact a treehouse! After a long day we had a delicious dinner at its restaurant, aptly named ‘The Treehouse’, where I had chicken fillet with mushroom sauce, and potato gratin (I was not adventurous enough to try the alpaca dish). 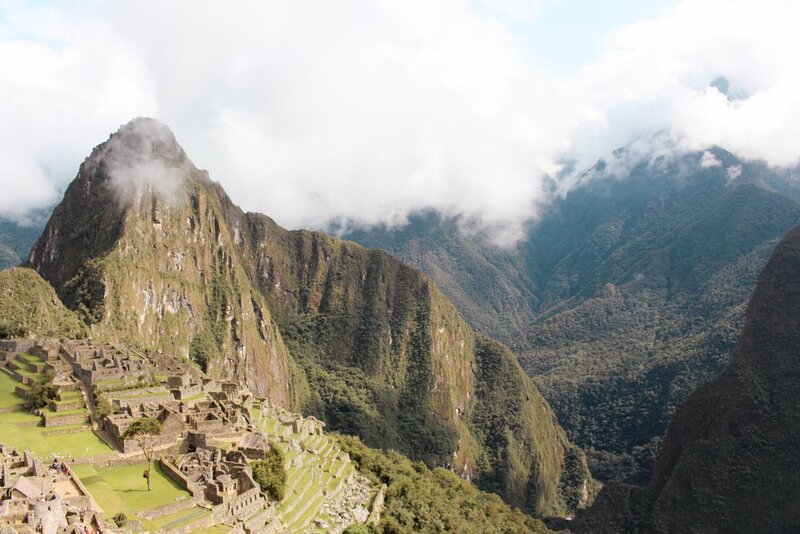 We woke up to views of the mountains, ready to finally see Machu Picchu, one of the Seven Wonders of the World. The Machu Picchu site is a 20 minute bus ride from the town, and already the views out of the window were breathtaking. Machu Picchu is surrounded on all sides by mountains. It was also more humid, surrounded by jungle, as opposed to Cusco which had a dryer heat. 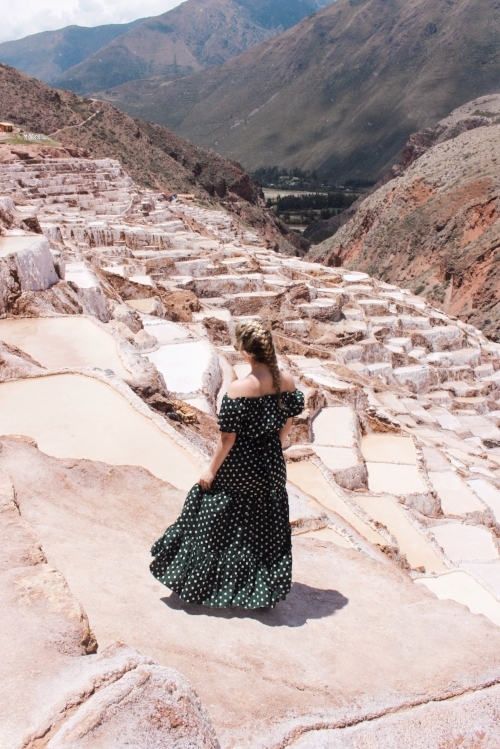 Peru is so diverse it has 28 out of the 32 world climates, and even though Machu Picchu is only a couple hours away from Cusco, we could feel the difference. Machu Picchu is often mistakenly thought to have been lost and then discovered in the early 1900s, but this is not strictly true. The locals were always aware of its presence, but it remained overgrown and hidden to the outside world until American historian Hiram Bingham made it known internationally. On our last day Acanela left us a day to do as we like. Cameron and I both agreed we wanted to see Rainbow Mountain, as we might not have the opportunity to go again! So we left the hotel at 4am (luckily our jet lag helped us with these early starts), and drove 3 hours away from Cusco. 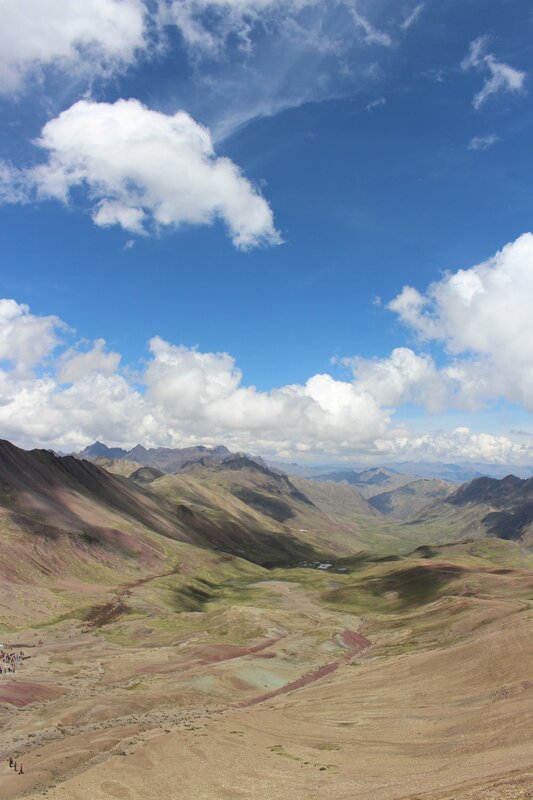 The trek to the Rainbow Mountain was then 3.5km each way, at an altitude of 5000m. The walk was long, but not too strenuous to begin with. However the last section was not for the faint hearted, I soon regretted not paying to go up on horseback! My poor brother even got altitude sickness. But from the top the view was unparalleled. The scenery looked as though we were in a Game of Thrones location, but then there were also glaciers and of course, the rainbow mountain itself (which locals say was a glacier 70 years ago). Thank you Acanela for a wonderful once in a lifetime experience. It was a wonderful trip to share with my brother, and we came back with photos and memories that will stay with us always.